Indeed, over the next 70 years, Drucker’s writings would be marked by a clear focus on relationships among human beings, as opposed to the crunching of numbers. His books were filled with lessons on how organizations can bring out the best in people, and how workers can find a sense of community and dignity in a modern society organized around large institutions. In 1943, Drucker became a naturalized citizen of the United States. He taught at Bennington College from 1942-1949, then at New York University as a Professor of Management from 1950 to 1971. Drucker came to California in 1971, where he developed one of the country's first executive MBA program for working professionals at Claremont Graduate University (then known as Claremont Graduate School). From 1971 to his death he was the Clarke Professor of Social Science and Management at Claremont Graduate University. The university's management school was named the Peter F. Drucker Graduate School of Management (later known as the Peter F. Drucker and Masatoshi Ito Graduate School of Management) in his honor in 1987. He taught his last class at the school in the Spring of 2002. Drucker was awarded the Presidential Medal of Freedom by U.S. President George W. Bush on July 9, 2002. He also received orders from the governments of Japan and Austria. He was the Honorary Chairman of the Peter F. Drucker Foundation for Nonprofit Management, now the Leader to Leader Institute, from 1990 through 2002. In 1969 he was awarded NYU’s highest honor, the NYU Presidential Citation. 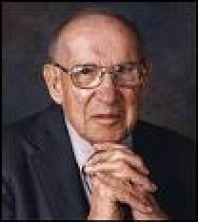 Drucker was inducted into the Junior Achievement U.S. Business Hall of Fame in 1996. Additionally he holds 25 honorary doctorates from American, Belgian, Czech, English, Spanish and Swiss Universities. 2.development - means only that management today has become an institution of our society." 3. "The best way to predict the future is to create it." 4. "Management is doing things right; leadership is doing the right things." 14"Rank does not confer privilege or give power. It imposes responsibility."